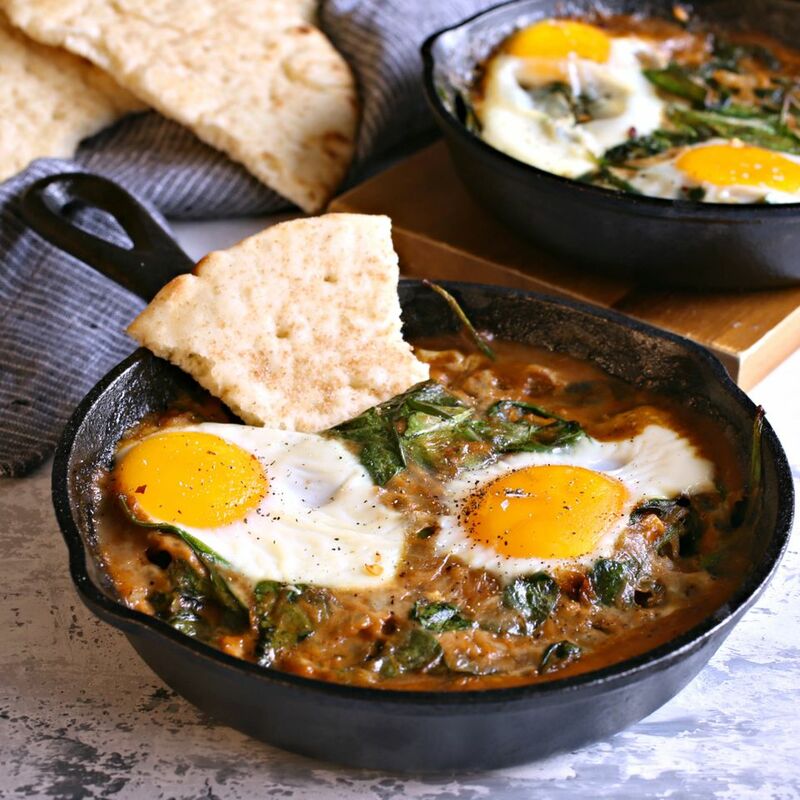 If you're a fan of the popular Mexican breakfast dish, huevos rancheros, sometimes called Spanish eggs in purgatory, then you likely also enjoy shakshuka. Both dishes are based on eggs poached or baked in tomato sauce, albeit with slightly different seasonings. The Mexican version of the sauce is spicy, whereas typical shakshuka tends to use cumin which is flavorful, but not hot. Other typical shakshuka ingredients are onions, garlic and peppers. But, as with most ethnic dishes, there are lots of variations. Just swap out vegetables and herbs and you'll have yourself a new and unique dish! Green shakshuka - like what's referenced here - can refer to the inclusion of any type of green vegetable, but spinach is probably the most popular. You can make it fully green by omitting the tomato sauce altogether. Or, use the recipe below to include both for a robust, flavorful and healthy breakfast or brunch entree. Add the 1 tablespoon of olive oil along with the diced onions to a large skillet or cast iron pan. Cook on medium heat for about 10 minutes or until the onions become translucent. Add the minced garlic and continue cooking for about another 1 minute. Push the vegetables to the side of the pan and melt the 1 tablespoon of butter in the center of the pan. Whisk in the tablespoon of all purpose flour until fully coated in the butter. Slowly whisk in the milk and then stir in the tomato sauce, ground cumin, black pepper and salt. Stir in the baby spinach leaves and continue cooking for another couple of minutes, stirring often, until the spinach begins to wilt. Note: At this point you can divide the mixture into individual pans and either continue with the cooking or set them aside until you're ready for the eggs. Fill each individual pan with equal amounts of the onion and spinach mixture and make two small wells in the middle of each pan. Crack two eggs into the wells and be careful not to break the yolks. It's easier to crack each egg into a small bowl and then transfer to the spinach mixture. Cover each pan and continue cooking on the stove top for about 10 minutes or until the eggs are set to your liking. You can also do this, uncovered, in a 375 F oven, but you'll probably need an additional 5 minutes for the whites to set. Sprinkle the cooked eggs with a dash of flaky sea salt and a pinch of red pepper flakes, if desired. Serve with crusty bread or warmed slices of pita or naan bread.